"Prisoner’s dilemma, game theory.Two prisoners are accused of a crime. If one confesses and the other does not, the one who confesses will be released immediately and the other will spend 20 years in prison. If neither confesses, each will be held only a few months. If both confess, they will each be jailed 15 years. They cannot communicate with one another. Given that neither prisoner knows whether the other has confessed, it is in the self-interest of each to confess himself. Paradoxically, when each prisoner pursues his self-interest, both end up worse off than they would have been had they acted otherwise." A random group of people are teamed together. If someone snipes while the other spots, the one who snipes will farm lots of damage and the spotter put himself at a higher risk of being spotted and killed. If no one spots, both will be spotted by the enemy. If both spots, then both gets hit. In random people, people rarely communicate. It is in the self-interest of the players to sit back and wait for someone else to spot. Which then ends up being worse off for the entire team since they lose caps and become surrounded and the team loses horribly. See example below. And yes, that is an entire red-team stacked up against each other all in one corner, most with full health. To simplify I'll split into the team into the subject (A) who has to make the decision whether to advance or snipe in the back depending on the others (B). Cost If the spotter advances when others snipe, the cost to him is larger than sniper since he'll be risking death. The cost to the spotter is 10, to the sniper it is 0 since fire is distracted from him.The flip case just reverses the roles, number is the same. 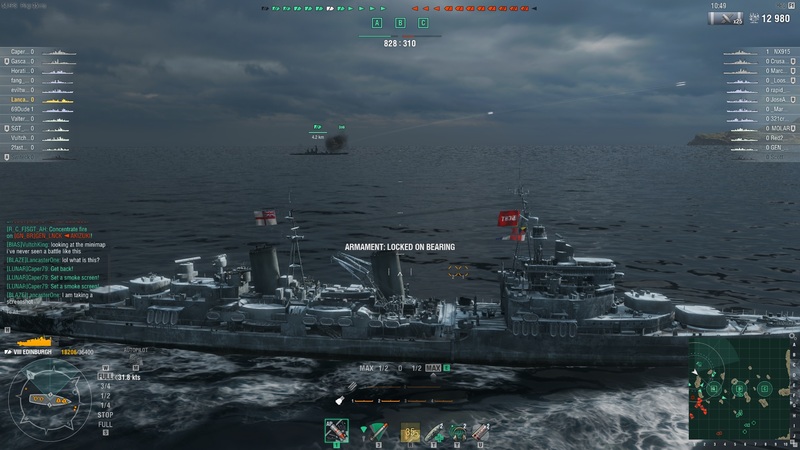 If they both snipe, the cost to them will be 8 since if they lemming no one is spotting and they become at the mercy of enemy destroyers who's lighting everyone up. Subject and others can't spot at the same time due to speed difference between ships. Now since people don't communicate in random games, you can assume incomplete information and each actor act based on their best self-interest. If the subject spots without cooperation, he'll always get -10. If the subject snipe from the back, he'll get either 0 or -8. So as you can see in this equilibrium, the rational choice would be to snipe from the back to minimize the cost to the individual. HOWEVER. If everyone snipe from the back, the most likely case is the team would lose. This is the problem I am trying to illustrate. Been in battles like that. May be more of a 50/50 occurrence than I remember, but it seems like the green team is more prone to these scenarios than the red team. Or at least it seems that way. Good effort and I see your point but I don't think you fully understand the Prisoners Dilemma. Why exactly would the confessor go free? There is a third variable which is the reward of win/lose condition of the game but assuming the subject does not want to die, I'm focusing on the cost to the individual for now. That's my understanding. I should have been more clear I think. My impression was that your by the book definition was perhaps off, but your in game analogy was spot on. This clarifies exactly that idea you presented was on the mark. Apologies for any confusion or obtuseness. I kinda just copied the "definition" of it from investopedia lol but yeah I think it speaks to a problem in game design if the "rational choice" leads to losing outcomes. Get a CV on your team, perma spot enemy, problem solved, nobody has to go to jail. This is in fact, a good argument for why cvs are needed, they spot for their team, and also farm dmg. As you can see, they had the lead in ships, HP, etc...if they would have pushed, they would have won, or at least made it close....but nope..
No CV spotting is one the most broken aspects of them currently. Ever watch a racing game and the lead guy accidentally makes a wrong turn and the 6 guys following him do the same? I think it's more along those lines. Ok, prove your theory is correct. Provide us with all the countless replays where all 12 players lived past 10 minutes and lost. Games are not lost because of caps contrary to what below average and average players perceive. They are lost because of what is called the snowball effect. 2-3 "special" players die in less than 5 minutes and the lack of guns and field presence exponentially increases the enemy's strength and it snowballs from there into victory. It's a lot easier to see the big red circles though on the screen and "FEEL" like you lost because of caps. You lost in caps as a BYPRODUCT of being down in ships. Get the crappers to grow a brain and learn to live past 10 minutes (while still doing damage of course) and you will see just how insanely OP your team is when you do that. And this notion that spotting increases your chance of being detected and sniping in the back decreases your chances of being detected went out the window when invisifiring was removed from the game. And if the "special" Shima player decides to charge a cap at the start of the match and you feel as though they are even 1% correct in doing so when there are 4 DDs a side and 2 or more enemy radar ships, then that is why you're still not breaking 50% win rate yourself. Outside of the extremely rare detonation mechanic, there is ZERO, let me repeat that because it sounds vaguely important.... ZERO excuse for dying before 5 minutes. Dying before 10 minutes is also pretty bad unless you did some seriously heroic moves that secured the win in such a way that you were completely not needed the rest of the match to achieve victory. And again, below average and average players grossly (often to a pretty disturbing degree) over-exaggerate their value when it comes to how much they contributed before they died which they use as justification to excuse away their poor play. And unfortunately, the frequency in which they do that is what keeps them below or just average players. After all, why self reflect and think about ways you could have improved if you lied to yourself and made yourself believe you did everything right? The bottom line is that unicum players got to be unicum players because they have mastered the ability to maintain equilibrium the entire match. That optimum point on the graph where the two lines intersect. The line of aggression and the line of prudent health conservation. Losers stay losers unless they put in the effort toward learning how to find and maintain that equilibrium. You camp too much, you do too little damage. You get overly aggressive and you die to soon and *gasp* you do too little damage. Go figure. The overwhelming majority of players in this game who are below average or struggling to advance much past average are actually far too much along the aggression line on the chart, not the conservation line. 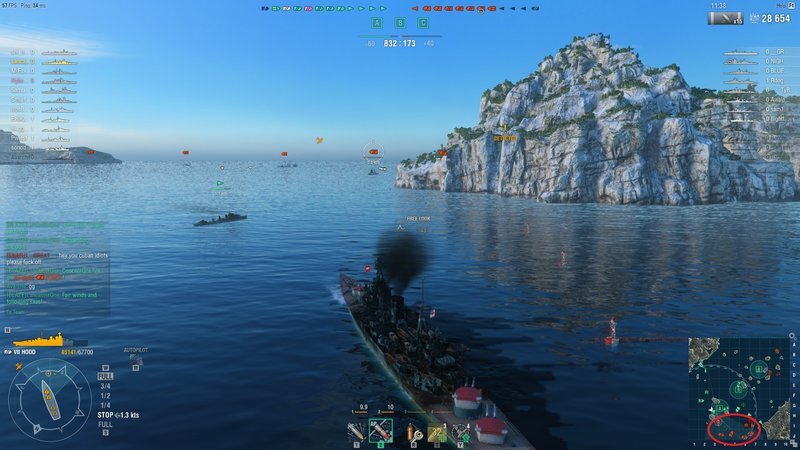 And the only people that seem to see it, again, are unicum players who understand the simple concept that you can't do damage, take caps, spot for your team, or do anything to help achieve the win if you are sitting at the bottom of the ocean. A person has to have a serious cognitive disability to not grasp that simple 1st grade concept and yet here we are. A massive portion of the community struggles with comprehending this. It's insane and beyond disturbing that players can play even 4000 - 5000+ games and still not see it. It looks like he wrote an entire essay on how he's good and other people are bad and die early, therefore bad people who die early is the cause of losing games, that's part of the puzzle on teamwipe losing conditions but the flip side is we are talking about caps. Each cap is a -3 pts/sec bleed. Down all 3 caps would be -9pt/sec. Losing condition is 1000pts. Game start at 300pts. Total countdown 700pts. Of course things get complicated once the team realizes they only have 77 seconds until they lose, panicked captains rushing and dying will further reduce/increase that timer. The matter is caps are important to winning. Tbh a lot of the behaviour in-game can be explained with it I've found. That maybe. Sometimes I ask in-chat why people are going into an obviously horrible tactical position. Sailing right into choke-points and killboxes created by the islands. They usually don't have an answer, they just keep going and then we lose when we get surrounded at all side and burnt/torped to death since it's a horrible tactical position but staying away from the herd means you'll get focus fired. This game can be infuriating sometimes, mostly because of the people. Location: "In a Brave New World"
In my opinion, what loses games is the lack of concentrated effort on contesting objectives. In other words only some ships are anywhere near a cap or other important point on the map to be effective and provide supporting fire. So you are damned if you Play The eFF-ing Objective and damned if you don't. We have all seen the "Lemming Trains", "Murder-Balls", "Meat Grinders that Lemmings jump into one at a time", "NASCAR", "Battleship camping society at the map border". Going alone to flank or cap is a losing proposition, a safe play is to have other teammates for enemy to shot at, safety in numbers and all, "MOBA mentality". Sadly the safe option loses less credits at the end of the match, then trying to PTFO and getting "Deleted" in the first 2 minutes of the match. Yep. It's becoming a bit of a recurring theme. No map control, everyone hunkered up in a corner, and then everything is turning into a slug-fest while one side loses out on points. "Combat Loss Grouping" good term! I'm borrowing that lol. Another example of map-control determining the tide of a battle below. You can see red became completely surrounded from all sides and the north group cut off from being able to support south since we got central map control. It's a bit of a reoccurring theme. You guys can rationalize and theorize all you want. But you claim i am wrong. That my preaching about the importance of equilibrium between smart aggression and health conservation causes losses. If that were true, my win rate should be lower than yours. And if you were logical and rational thinkers you would focus on what actually produces results (wins). And maybe demonstrate the humility and open-mindedness (both incredible demonstrations of strength) to toss out what you think you know (because it's not producing results) and benchmark off of unicums (not me, people better than me) who will tell you the same damn thing I'm telling you. Or go ahead and huddle up with your other 50% and below win rate players and feed off of each other's confirnation biases and forever remain avg and below avg players. Just do me a favor, try to load up on the other team in my matches and I encourage you to charge those caps in suicide fashion because I'll have some presents for you. Why are you so defensive? No one claimed you were "wrong", I said your answer is correct on team-wipe conditions, but there's more than one way to win the game, we are tackling this from a game-theory perspective on cap-induced ticket lost conditions, this is your second post of just tooting your own horn now. Boiling down your paragraphs, I got lines after lines of "unicum players like myself are good, be me, get good, not be me, you're trash", the only useful comment out of two paragraph is "balance equilibrium between smart aggression and health conservation, don't overestimate yourself, caps are an illusion", thanks for contributing. Nothing to do with me, i specifically said other unicums because you guys are the defensive ones that always spin it and call it arrogance. I'm not talking about strictly team wipe conditions. You might be able to take a cap or two, but unless you're killing ships, you won't KEEP them. The enemy will just take them from you and they will keep them. And if you were actually being scientific, you'd observe that the majority of wins on points instead of 12 ship wipes are won because the winning team had more ships still floating. Maybe when you actually log that statistic you'll realize you're the defensive one by claiming passive players are more common than overly aggressive players and that is 100% undeniably false. The prisoner's dilemma is a famous model for cooperation and conflict. If you had any experience in business, wargaming or even in the insurance industry you would know this. Didn't you learn about Aristotle as a child in grammar school? If Greek logic escapes you, maybe you should try reading The Red Badge of Courage by Stephen Crane, a book most people read at an early age. This illustrates the tension between bravery and fear in a way you might feel instinctively without having to think so much. The primary condition for the dilemma, that the two cannot communicate with each other, does NOT apply in WOWS and one should view its application with extreme skepticism.